My dog Winnie went to heaven a week ago. Those who lost their beloved friend know how is that mix of happy, sad, happy, sad, happy feelings… and that’s why I wrote a letter to Winnie. This is the short version. The long version will be written every day while I keep talking to her. I have thousands of photos, but the best picture, is the one that remains with the soul. It’s been only a week since you left, since you crossed the rainbow bridge. God gave you wings to come into our lives and now He gives you wings to go back to heaven and fly back to our hearts. Winnie, we will always love you. I keep talking to you and seeing you in every corner of the house, at the park and inside the car. Your presence is so strong that I have no doubts you are here, giving me signals that the love you gave will always be with us. I don’t know how heaven or the rainbow bridge look like, but I am sure that now, your spirit lightens hundreds of stars. It is hard to smile, but I do it every time I think of you. Tears are a mix of sadness and happiness that clean the soul leaving good memories. My mom brought you into our lives. Now both of us miss you like the days when Samantha and Camila crossed the rainbow bridge. You must be with them for sure, all of you running on a green field, surrounded by lakes and with the bluer sky you’ve ever seen. For that reason I am fine, because now you rest happy in peace and I know one day we will meet again. 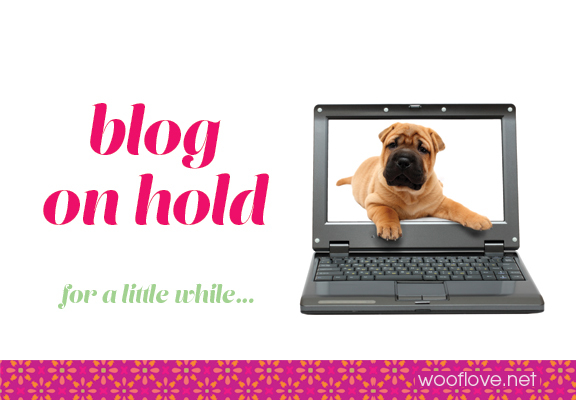 If you are reading this post is because you like to visit our Woof Love blog... thank you, we love visitors! And because we want you to come back again and again, we need to put the blog on hold for a couple of weeks. Winnie (my dog) and I are working in some new projects. One of them is the new Woof Love official website! and some other design projects for clients. We want to post only inspiring and fun stuff for you and right now, we need to take a break. We will be back soon! In the mean time, keep reading our Facebook page. We will be posting on Facebook as usual!